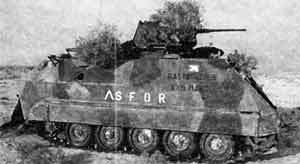 The Infantry Armoured Fighting Vehicle (IAFV) was the result of a development programme by the Automotive Technical Service (Servizio Tecnico della Motorizzazione) of the Italian Army to increase the combat effectiveness of the M113A1 APC. 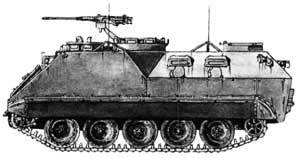 The Infantry Armoured Fighting Vehicle is based on the M113A1 APC which Fiat, Lancia and Oto Melara manufactured under licence from the then FMC Corporation (this became United Defense and in mid-2005 BAE Systems, Ground Systems Division) of the US in the 1960s. 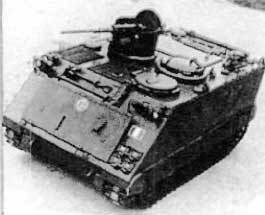 Main improvements over the M113A1 can be summarised as increased firepower, improved armour protection, the infantry's ability to aim and fire their weapons from inside the hull, and improved seating arrangements. 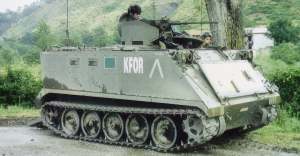 The IAFV is called the VCC-1, or Camillino, by the Italian Army. Final deliveries were made to the Italian Army in 1982 when production of the TOW armed version of the VCC-1 for Saudi Arabia began. Details of Italian production of the M113 series of full-tracked armoured personnel carriers are given in a separate entry. Production of the VCC-1 was completed some time ago and some vehicles have now been upgraded from the current A1 configuration to the A2 plus package comprising a mix of A2 variants (suspension and cooling) together with other derivatives equipped with the most recent A3 RISE (Reliability Improvement for Selected Equipment) package. The standard RISE package includes an upgraded propulsion system (turbocharged Detroit Diesel engine and new Allison transmission), improved drive controls (new power brakes and conventional steering controls) and 200 A alternator. The VCC-1 series has now started to be supplemented by the Dardo infantry fighting vehicle. As of mid-2007 only 200 Dardo IFV had been delivered to the Italian Army. The hull of the IAFV is made of all-welded aluminium armour with an additional layer of steel armour on the front and sides of the hull to improve ballistic protection. The driver sits at the front of the hull on the left and has a single-piece hatch cover that opens to the right. There are four M17 day periscopes to the front and left of his position and a single M19 day periscope, mounted in the hatch cover, which can be traversed through a full 360°. 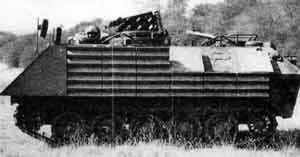 The M19 can be replaced by a passive periscope for night driving. The power pack is mounted to the right of the driver with the air inlet and outlet louvres in the roof of the vehicle. The engine compartment is fitted with a fire warning and extinguishing system and the engine is coupled to an Allison Transmission TX-100 transmission which consists of a three-speed gearbox and a two-stage torque converter which gives six forward and two reverse gears. Access to the engine for maintenance is by a panel in the glacis plate and panels inside the crew compartment. The vehicle commander sits immediately behind the driver and has a single-piece hatch cover that opens to the rear, and five M17 day periscopes. The gunner sits to the right of the commander and has a three-piece hatch cover providing protection to his sides and rear when raised, and five M17 day periscopes. The six infantrymen sit at the rear of the vehicle, three down each side of the hull on individual seats. The first four face outwards and the last two inwards. The upper part of the hull sides of the personnel compartment is sloped to improve ballistic protection and in each side of the hull are two firing ports, each with a rectangular vision block over it. The infantrymen enter and leave the vehicle by a power-operated ramp in the rear of the hull. There is a firing port in the right side of the ramp and an emergency door in the left side should the ramp fail to open. In the roof of the personnel compartment, at the rear, is a rotating hatch, which is covered by a three-part triangular hatch cover when not in action. The forward part of the cover folds forwards and is locked vertical and the two side covers open to the outside of the vehicle. These are also locked vertical to provide protection for the machine gunner. A 7.62 mm machine gun can be mounted at this position to provide covering fire to the rear of the vehicle. The two fans in the top of the hull, one either side of the rear gunner's position, expel fumes from the personnel compartment. There are two aluminium diesel fuel tanks mounted each side of the ramp at the rear. The torsion bar suspension either side consists of five dual rubber-tyred road wheels, with the drive sprocket at the front and the idler at the rear. There are no track-return rollers. The first and last road wheel stations are provided with a hydraulic shock-absorber. The basic model of the IAFV is called the Mk 1 and is armed with a pintle-mounted 0.50 (12.7 mm) M2 HB machine gun. The Mk 2 version, which is not in service with the Italian Army, has a remote-controlled 0.50 (12.7 mm) machine gun. The Mk 3 version, still at the prototype stage, has an externally mounted 20 mm cannon. The IAFV is fully amphibious, being propelled in the water by its tracks. Before entering the water a trim board is erected at the front of the hull and the two electric bilge pumps are switched on. The vehicle is fitted with passive night vision devices but has no NBC system. The Italian Army deployed some 50 VCC-1 IFVs to Somalia which were subsequently fitted with an Enhanced Appliqué Armour Kit (EAAK) similar to those fitted to the AAV7A1 amphibious assault vehicles of the US Marine Corps. This armour package provides protection against penetration from small arms fire up to 14.5 mm as well as 155 mm projectile fragments. The total weight of the kit is 750 kg and crew survivability is further enhanced by the installation of spall liners inside the rear crew compartment. The EAAK armour plates use Special Spaced Armour (SSA) which consists of a laminated structure of special steels with non-metallic layers between them. These steel plates break and deflect kinetic energy projectiles and reduce the residual energy so that the projectile or debris cannot penetrate the hull. These kits were developed by RAFAEL of Israel and supplied to Italy by the FMS Corporation (now Marvin Land Systems) of Los Angeles under a contract worth USD1.5 million. The contract was awarded in July 1993 and the kits were delivered and fitted to the vehicles in Somalia early in October, ahead of schedule. Saudi Arabia placed an order worth LIt350,000 million with Oto Melara for 224 VCC-1 vehicles fitted with the same Systems & Electronics Inc TOW ATGW as the M901 Improved TOW Vehicle. The first 10 production vehicles were delivered early in 1983 and final deliveries were made in 1984. Full details of the M901 Improved TOW Vehicle are given in the Tank destroyers section. This is no longer in service with the US Army, but remains in service with many other countries. The US Marine Corps uses the same launcher on a now General Dynamics Land Systems - Canada LAV (8 × 8) chassis. 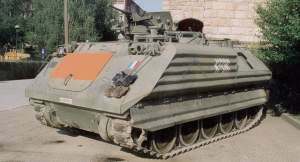 This is the Italian-built M113 with appliqué armour fitted to the front and sides. There are two firing ports with a bulletproof vision block above in either side of the rear troop compartment. The VCC-2 has the standard circular hatch for the driver. To the rear of this is a circular hatch for the commander, while the gunner has an externally mounted 0.50 (12.7 mm) M2 HB machine gun with lateral protection.